Wednesday 14th November marks World Diabetes Day. This year the focus is on the role family plays and the many ways they can help us all to maintain good health and wellbeing. Would you know how spot the warning signs in your family? Diabetes Queensland believes education and ongoing support should be accessible to all individuals and families to help manage diabetes. Head over to the Diabetes Queensland website to find the most current information and support events in your area. 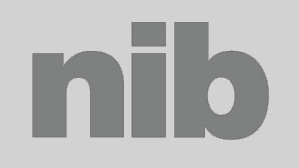 You can also contact Diabetes Queensland on 1300 136 588 for extra information or support. Diabetes is a metabolic disease leading to high levels of sugar in the body. It is one of the most commonly encountered chronic diseases identified by health care providers including dentists. What many people might not realise is that there is increasing evidence and research showing a two-way relationship between gum disease and diabetes. 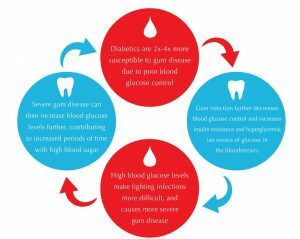 Not only are people with diabetes more susceptible to gum disease but also chronic gum disease can make the control of blood sugar levels more difficult. Uncontrolled blood sugar causes a rise of sugar in the saliva, in turn causing a significant increase in bacterial activity. The body’s inflammatory response to the bacteria causes bleeding gums (gingivitis) and detachment of the gums and bony support around the teeth (periodontal disease). The teeth will also be at a higher risk of dental decay. Periodontal health is of great importance to a diabetic control plan. The periodontium includes the ligament surrounding each tooth root and the supporting structures of that system including the bone and gums. It is this system that is critical for maintaining the teeth in the bone and enable chewing. When you have a professional cleaning, the bacterial biofilm and food debris is momentarily removed, disabling the bacteria and allowing your gums a chance to heal. Done routinely, the professional cleaning reduces the inflammation and therefore the risk of gum disease progressing. The direct relationship between diabetes and oral health is important to understand so that everyone can be empowered to take control and manage their blood sugar levels to the best of their ability, prolonging a healthier and happier life! 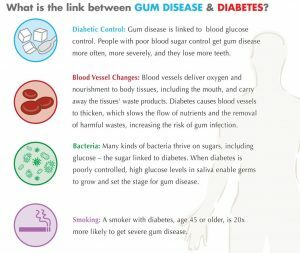 People with well-controlled diabetes and blood sugar levels have the same level of risk of gum disease as people that live without diabetes. Follow a healthy diet or see an Accredited Practicing Dietitian for assistance. Clean your teeth and gums twice a day with tooth paste that contains fluoride. It is also a good idea to gently brush your tongue each day to remove bacteria and keep your mouth fresh and healthy. Use dental floss or interdental cleaners every day to clean between your teeth. Avoid a dry mouth by drinking plenty of water and chewing sugar-free gum to stimulate saliva production. Biotene has a range of dry mouth products that may help as well as GC Dry mouth gel from your dental practice. First aid for a hypoglycaemic event is sweetened foods or drinks to quickly increase the blood glucose levels – frequent intake of these can lead to tooth decay, therefore ensure you rinse your mouth with water once the hypo is resolved. See your dentist every six months (even if you wear dentures, you are still at risk of some oral diseases). 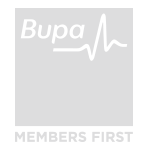 It is important patients with diabetes inform their dentist and outline the names of all prescribed and over-the counter tablets and medicines being taken. The British Heart Foundation has a great video explaining the links if you would like to see it you can click here. 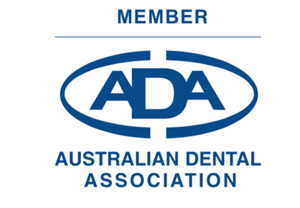 Or if you would like any further advice or information please don’t hesitate to contact our team on (07) 3366 4298 or ask your dentist at your next appointment with us!